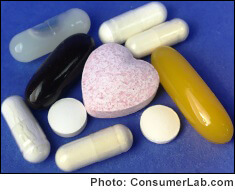 Make sure the sterol or policosanol supplement you take passed our test and is right for you! Research shows that plant sterols (phytosterols) can help lower elevated cholesterol levels — a key risk factor for heart disease. But do sterol supplements on the market contain what they claim and provide a dose shown to work? If so, which one is best? To find out, we tested popular phytosterol supplements on the market. We discovered that not all products contain what they claim, and those that cost more aren't necessarily better quality. Among the products that passed all of our tests, we selected a Top Pick. We also tested several supplements containing policosanol, another ingredient promoted as lowering cholesterol. Among the policosanol products that passed our tests, we selected the one that provided the best quality of the most researched form at the best price as our Top Pick. ConsumerLab.com also reviewed the evidence for many other ingredients promoted as improving cholesterol levels and/or triglyceride levels. You must be a member to get the full test results for plant sterol and policosanol supplements along with ConsumerLab.com recommendations and quality ratings. You will get results for ten supplements: Eight selected by ConsumerLab.com and two others that passed the same testing through our voluntary Quality Certification Program.